Can You Really Make Money Writing About Theme Parks? Everyone loves them, right? Granted, they do have long lines, and the drinks are kind of expensive… but the rides are awesome, and the funnel cakes are pretty much out-of-this-world! If you are a writer who is currently looking for some freelance writing work, did you know that you can actually make some potential side-hustle cash writing about theme parks? I recently found a website called themeparktourist.com where they claim to pay you for articles about exactly that… theme parks. This is basically a website about theme parks. Yes, it does sound simple, but that is pretty much the best way to describe it. They publish all kinds of articles on this topic, and actually do a great job of it too! 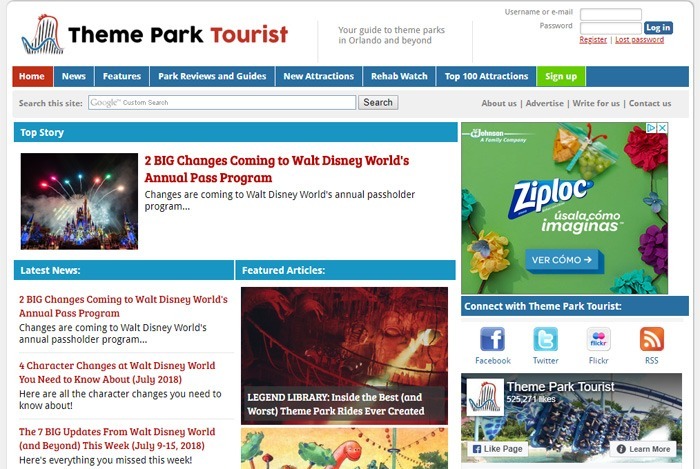 On the landing page, you can see several different tabs to choose from, including options like: News, Features, Park Reviews and Guides, New Attractions, Rehab Watch, Top 100 Attractions, and so on. There is also a feed on the landing page with not only the latest news, but also a list of featured articles. The website certainly looks and feels like a blog, and I noticed that there were quite a few banner ads. But all things considered, my first impression was not a bad one, by any stretch of the imagination. I will admit that I was surprised to find a website like this that was entirely dedicated to theme parks… but then again, why not? Theme parks are fun and insanely popular. They might not be something that I do every single day—but hey, we all love a good roller coaster ride, right? My next order of business was to read through some of this content. I wanted to get a feel for the quality and style being published, so I did some reading to conduct my research. I spent some time reading through the content on the website… and I will say that I was very pleasantly surprised by how good it was. I was especially impressed with one particular piece that talked about Tomorrowland, a theme park created by Walt Disney back in 1955. The article detailed the history of several of the attractions shown there, especially a ride called 20,000 Leagues Under The Sea: Submarine Voyage. I was amazed that this review was so well done, despite the fact that the attraction actually closed years ago. I was also amazed at the detailed historical writing that was put into it. Whoever wrote this piece obviously did a lot of fact finding and research, and it really showed. Historical writing can be a challenge, especially when you are writing about a more ‘obscure’ topic. So that served to make this piece (and many others on the same page) all that much more impressive. So yeah. Thus far, I had learned that I definitely underestimated this site at first glance. Needless to say, I was quite interested in hearing about how I could write something and pitch it to ThmeParkTourist.com. I do not visit theme parks often… but the next time I do, I would love to be mindful and aware enough to take some notes so that I can write a compelling article upon my return and pitch it. Note: As it turns out, this site is not really into one-time posts. They like to hire writers who will deliver consistently… but we will get to that in a moment! So the next thing I looked at were the writing guidelines. Here is what I discovered. The ‘Write For Us’ page on this website ended up being pretty informative. Here is a screen shot of it. Here is a summary of some of the things I learned here. If you do become a writer on this site, they will ask you to contribute two articles per month. From the sound of it, this site is not as into one-off contributions. The great thing about this site is that they actually pay really well. For an article of up to 1,000 words, you get paid $50… which is certainly not too shabby. Of course, this is dependent on your pitch being accepted. You obviously need to be technically skilled enough to impress them as a writer, but also knowledgeable enough about theme parks to make your pitch interesting. But if you can surpass these challenges, this could be a pretty decent side-hustle opportunity. And if you scroll down even further from here, they give you quite a bit of information about writing content that is more likely to appeal to readers and get accepted. They also talk about the audience, the role that the content plays on the site, and examples of the types of articles that tend to do the best. It really sounds like they are trying their best to give their writers the best possible advantage before they even pitch, which is quite appreciated. Obviously, as stated before, they want writers who can regularly contribute. They even go as far as to specifically say that they are not really interested in one-and-done authors, which makes them even better… because the ‘Holy Grail’ for writers is certainly work that turns into more work. But this begs the question… who visits theme parks that often? I guess I could see a few different possibilities. There are obviously a lot of different possibilities here. This just seems like a niche in which the writer would have to at least have a little bit of first-hand knowledge/experience about the topic. I also saw, at the bottom of their Write For Us page, that their roster is currently full of writers. They do, however, still welcome visitors to submit an application, and they say that they will consider it when a vacancy opens up. So that is kind of a letdown, but also hopeful. I am not sure how often they hire writers, but I am sure that it happens sometimes. At this point, I felt like I had learned enough to weigh in on the idea of pitching to this site with my final opinion. Here is what I ended up deciding after doing my research. I really liked this website for several reasons. 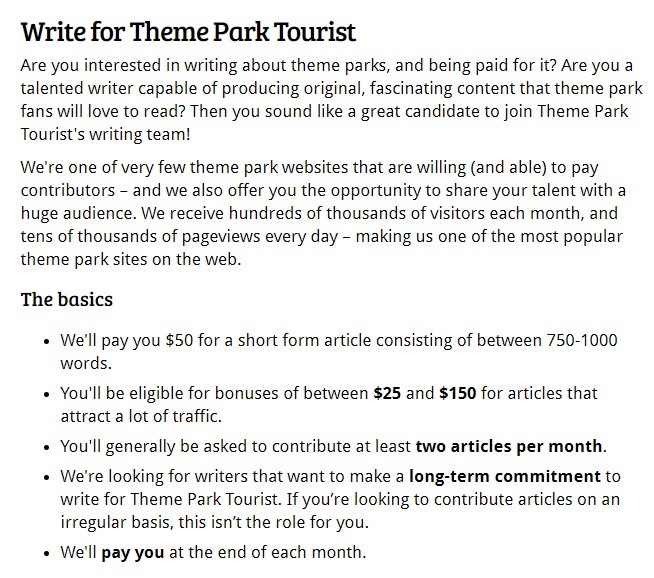 If you are thinking about taking on some freelance writing work, and want to write for a website that actually pays well, then ThemeParkTourist.com is actually a really cool site. Now, with that being said, it is all about theme parks. So if you don’t like theme parks, don’t know anything about them, and/or have no interest in researching them, then I would probably not recommend that you pitch to this one. This site is also open about not being interested in one-time submissions. They are definitely looking for the kind of writer who wants to stick around and be consistent—so keep that in mind as well. But with that being said, there were a lot of upsides. The content on Theme Park Tourist is actually really, really good. It would look awesome on your resume to have something published here. It would also pay well enough to make it worth your time, especially with the fact that the work would be consistent. They are not currently accepting writers, but that will probably not last forever. If I were you and were interested in writing about theme parks, I would give it a visit and apply just to get the process started. You never know what could happen! You won’t get rich writing for websites like this, but freelance writing isn’t necessarily a gig that ‘gets people rich.’ It can, however, provide you with some pretty decent side-hustle cash. And that is most definitely a good thing!